December 2018 promotion valid: 1 - 31 December 2018, excluding Public Holidays and Saturdays. Group Package Terms & conditions apply. Please enquire at reception for more information. 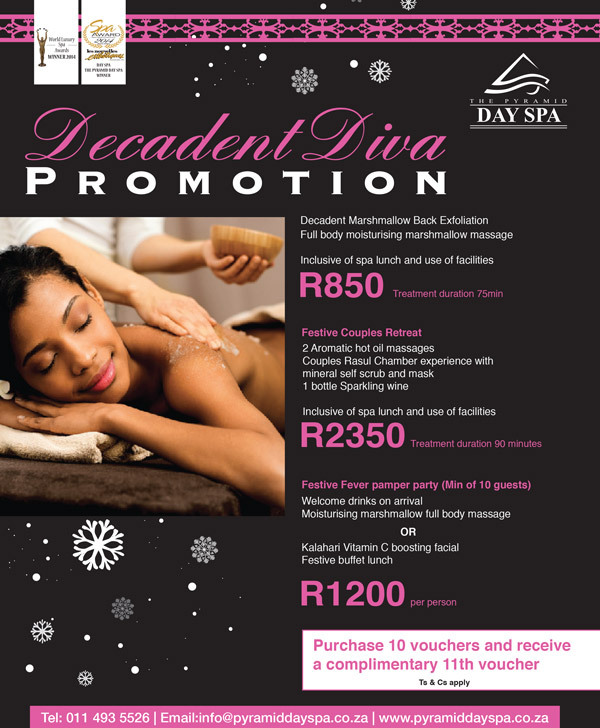 Promotions and Specials cannot be redeemed with discounted vouchers or other special offers. Halaal or other special dietary requirements will incur an extra cost. Bookings subject to availability • Deposits may be required to secure bookings • Spa Packages & group bookings, require full payment 48 hours prior to booking date • Cancellations within 24 hours prior to a scheduled booking, may incur a cancellation fee • “No Shows” on day of scheduled appointment, without prior notice will be charged the full treatment cost • Late arrival, may result in a reduction of treatment time, whilst the full treatment fee will apply • No return policy on purchase of retail products • Cash, credit & debit card payment accepted • Please complete a client consultation form upon arrival • Please advise the spa & your therapist of any serious medical conditions or health concerns - Whilst every care has been taken to ensure the wellbeing & care of your person and personal belongings, you still remain responsible for your own personal safety & that of your personal belongings • SPA Hours: Monday - Saturday 08h30am - 05h30pm, Sundays 08h30am - 04h30pm. • Open on most Public Holidays unless otherwise advised.